Kašperské Hory is a mountainous resort rich in history. 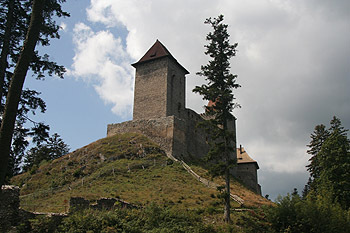 The Kašperk castle, built by Karel IV to guard the border and protect the trade route and local gold mines, is towering above the town. There are two guided tours available and from April to October the castle offers a rich cultural programme. Special Christmas, Easter and Lent events take place annually. 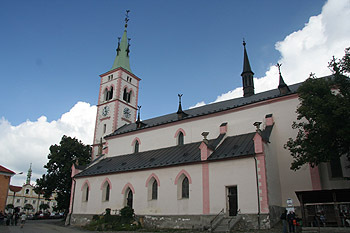 There are two museums in the town, the local history museum The Museum of Šumava featuring extensive exhibitions on glass making, wood cutting, gold mining, natural history exhibits, folklore and seasonal exhibitions. The museum is open from May to October. The other museum, the Museum of Historical Motorcycles and bicycles with an exposition on Czech Wooden Toys and Brewery is open all year round. One can enjoy local countryside by following 5 circular routes and 2 nature trails suitable both for walking and cycling. In winter there are tracks for cross country skiing covering 20 km and a down hill skiing complex with artificial snow, 3 ski lifts and a ski school. Tourists can enjoy a whole array of services in the Best Western Aparthotel Šumava 2000 such as horse riding, tennis courts, bike hire, ski hire and a bowling bar. There are many restaurants and accommodation possibilities available in the town catering for everyone: hostels, pensions, and hotels ** - ****. Congress tourism facilities are available in the Parkhotel Tosch****, hotel Šumava*** and Best Western Aparthotelu Šumava2000 ****. Many cultural events take place throughout the year (concerts, exhibitions and theatre performances). There are two information centres available for tourists throughout the year.